2018 IID Meeting Update: Pollutants And The Skin - Elias and Williams: The Inside-Out of Skin by dermatologists and skin researchers Peter M. Elias, M.D. and Mary L. Williams, M.D. 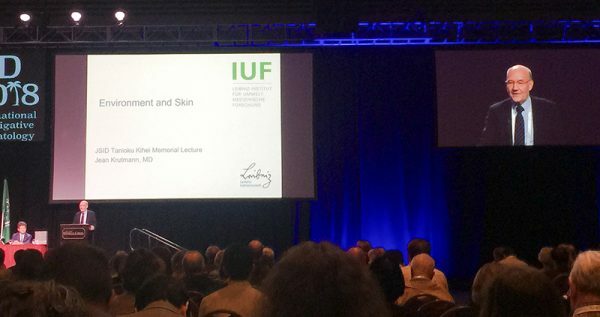 Environmental pollutants and how they affect skin was a hot topic at the 2018 IID meeting in Orlando. Dr. Jean Krutmann, Professor of Dermatology and Environmental Medicine at the Heinrich-Heine-University Düsseldorf, delivered a plenary presentation in a symposium devoted to this subject, where he provided a brief overview. The extent of the problem, Krutmann noted, is alarming. In northern India and much of China, the populace is exposed to levels of pollution comparable to smoking ~25 cigarettes a day. It is estimated that, worldwide, about 7 million people a year die from exposure to pollutants. And matters are getting worse! This number that is projected to burgeon to 50 million by the year 2050! Even in the US, and even in affluent cities like Denver and Los Angeles, as well as in parts of Texas, pollution not infrequently reaches dangerously high levels. Air-borne pollutants of various types and from a variety of sources (e.g., exhaust particles from motor vehicles, ozone from fluorinated hydrocarbons, methane from livestock, as well as sulfur dioxide, nitric oxide, sulfur dioxide, carbon monoxide, cigarette smoke, and emissions of heavy metals) all contribute to the morbidity and mortality. Pollutants Cause Cancer, Heart Disease and Even Diabetes. Dr. Max Costa, Chair, Department of Environmental Medicine and Professor of Biochemistry and Molecular Pharmacology, New York University, showed how some of these heavy metals, particularly arsenic, nickel and chromates can bind to nuclei, and increase the risk of cancer. Where you live dictates the types of metal pollutants to which you are exposed and, in turn, to the manner of health risks that they pose. For example, in the vicinity of Saudi Arabian oil refineries, pollutants are released that stimulate certain genes, which can increase the risk of diabetes, obesity, metabolic syndrome and atherosclerosis. Nickel mines near Sudbury, Ontario instead emit sulfur dioxide and nitric oxide, pollutants which can block cell division and break chromosomes, and thereby increase the risk of cancer. Dr. Krutmann studied effects of pollution on the skin of people living in the heavily industrialized Ruhr Valley in comparison to those residing in more rural farming communities of Germany, as well as in different parts of China. He has found that traffic-related pollutants, particularly soot from diesel engines, and nitric oxide partner with light (not only the sunburn-causing UV-B and UV-A ultraviolet spectra, but also with visible light and infrared irradiation), and this partnership, along with excessive stress and suboptimal nutrition, accelerate skin aging. The principal signs of pollutant-accelerated skin aging is increased numbers of pigmented age spots (‘lentigines’). Pollutants Also Harm The Skin Barrier. But evidence is also accumulating that pollutants can damage the skin barrier, and thereby potentially increasing the risk of atopic dermatitis, and perhaps also accelerating the development of skin cancers. How Pollutants Act On Skin And How Skin Protects Itself From Injury. Dr. Krutmann also has identified how some of these pollutants inflict their harm, and conversely how other mechanisms protect the skin from damage. For example, while the pigmentation that is induced by pollutants may not be desirable to those who develop it, it is there for a reason. Melanin has antioxidant properties, and is capable of binding many of the free radicals that cause other types of damage to the skin. Liang Liu, PhD, Assistant Professor of Dermatology at Columbia University has studied how polycyclic aromatic hydrocarbons (PAHs) emitted in diesel exhaust both bind to nuclear DNA and stimulate the generation of free radicals. The latter exert their damage by provoking inflammation in the skin, yet they simultaneously activate two protective mechanisms. They induce an increased production: 1) of an enzyme, called CYP1A1, which breaks down PAHs; and 2) of an antioxidant protein called, thioredoxin interacting protein (TXNIP), which can quench free radicals. Dr. Wendy Roberts, Director of Dermatopathology, Loma Linda University, added some interesting additional information about skin damage from pollutants. In addition to the same type of age-related pigmented spots that were described by Dr. Krutmann, she has observed an increase in melasma (the well-known type of hormone-stimulated pigmentation that occurs on the face of pregnant women) in her patients, as well as darkening around the eyes. (This later observation, in our opinion, could also reflect the increased levels of psychological stress that result from prolonged exposure to a polluted urban environment). Dr. Roberts also believes that pollutants are causing more frequent flares of acne, which would not be surprising, since it has been known for some time that hydrocarbons can plug hair follicles and induce an acneiform eruption. We could do well to take Dr. Roberts advice for how to cope with this problem – she regularly advises patients to scrub their faces in the evening to remove any adsorbed pollutants, and to apply high SPF sunscreens along with a protective foundation in the morning.